© Moro et al. ; Licensee Bentham Open. Functioning Assessment Short Test (FAST) is a brief instrument designed to assess the main functioning problems experienced by psychiatric patients, specifically bipolar patients. It includes 24 items assessing impairment or disability in six domains of functioning: autonomy, occupational functioning, cognitive functioning, financial issues, interpersonal relationships and leisure time. The aim of this study is to measure the validity and reliability of the Italian version of this instrument. Twenty-four patients with DSM-IV TR bipolar disorder and 20 healthy controls were recruited and evaluated in three private clinics in Cagliari (Sardinia, Italy). The psychometric properties of FAST (feasibility, internal consistency, concurrent validity, discriminant validity (patients vs controls and eutimic patients vs manic and depressed), and test-retest reliability were analyzed. The internal consistency obtained was very high with a Cronbach's alpha of 0.955. A highly significant negative correlation with GAF was obtained (r = -0.9; p < 0.001) pointing to a reasonable degree of concurrent validity. FAST show a good test-retest reliability between two independent evaluation differing of one week (mean K =0.73). The total FAST scores were lower in controls as compared with Bipolar Patients and in Euthimic patients compared with Depressed or Manic. The Italian version of the FAST showed similar psychometrics properties as far as regard internal consistency and discriminant validity of the original version and show a good test retest reliability measure by means of K statistics. Keywords: Functioning, Bipolar Disorders, Validity, Reliability, FAST Italian. The measure of the functional status in Bipolar Disorders is becoming a real challenge in the today research . Early emotional abnormalities and poor premorbid functioning tend to occur in BD [2,3]; however, adequate psychosocial adjustment prior to the first manic episode is also common [4-6]. Moreover, after illness onset, many people with BD regain psychosocial functioning , yet others suffer some extent of functional decline, which progresses from a state of psychosocial adjustment to a state of disability [7, 8]. In fact in contrast to early observation carried out by Kraepelin , recent studies do not describe such a favourable outcome in patients with bipolar disorder [10-13]. Tohen et al. (2000)  found that only 37.6% of bipolar patients achieved functional recovery 24 months after admission. Not surprisingly, BD has been estimated as one of the five most burdensome disorders at the individual level all over the world . Whereas some people with BD is able to accomplish historical landmarks in human achievement [16, 17], others experience significant difficulties in performing daily routines . The remarkable functional variability in BD highlights an inherent prognostic complexity [19-23]. Many studies have clarified several aspects of illness progression in BD , yet significant improvement to functional outcome may require further theoretical and clinical advancement . The FAST (Functioning Assessment Short Test)  was developed for the clinical evaluation of functional impairment of patients suffering from mental disorders particularly bipolar disorder. The 24 items of the scale are divided among 6 specific areas of functioning: autonomy, occupational functioning, cognitive functioning, financial issues, interpersonal relationships and leisure time. Taking into consideration the opinion of experts the performance of previous scales and the literature, the aforementioned items were identified as the main problems experienced by people suffering from severe mental disorders, including bipolar patients [26-28]. The FAST showed good psychometric properties as validity and reliability and it was sensitive to different mood states in Bipolar Patients . It is a simple interview, which requires a short period of time for administration and it was found easy to apply . The measure of specific domains of functioning impairment may be of interest in the assessment of supplemental interventions targeting rehabilitation/-functional enhancement of BD patients. FAST may also be useful in assessing the effect of pharmacologic and psychosocial interventions on functioning of bipolar patients. The purpose of the present study was to validate the Italian version of the FAST for its use as an instrument to assess functional impairment in subjects with bipolar disorder. Twenty-four bipolar patients were selected and evaluated in three private clinics in Cagliari, Italy. Diagnosis were conducted according to the Structured Clinical Interview for the DSM-IV TR criteria (SCID-DSM-IVTR) . 20 healthy controls were also selected. The healthy comparison group was recruited from the general population within the catchment area of Cagliari. The study was approved by the Università Europea del Mediterraneo Onlus Ethics Committee and was carried out in compliance with the Helsinki Declaration of 1975 (the Evaluation, Support and Prevention Unit). All subjects contacted were informed about the study and if they decide to participate they signed a consensus form. All subject remaining stable for at least one week, according to YMRS, HDRS-17 and GAF (twenty-two patients and all controls), participated in a Test-Retest reliability assessment one week later and were included in the study. The clinical researchers were preliminary trained in the use of the study tools. One clinical researcher recorded the socio-demographic and clinical variables of each patient, administered the SCID-DSM-IVTR and the Italian version of the Young Mania Rating Scale (YMRS) , the Italian version of the 17-item Hamilton Depression Rating Scale (HDRS-17)  and the Global Assessment Functioning (GAF)  to confirm the stability of the patient's condition and overall functioning. She also recorded all the medication prescribed to the patient for each visit. Finally, a second researcher administered the FAST. Interviewers administering the FAST and the GAF were blinded to each other. The control subjects were screened using the SCID (DSM-IV TR) to exclude current or lifetime psychiatric disorders. Controls had no first-degree relatives with bipolar disorder or other psychiatric disorders. All the study tools out if the SCID interview were re administered a week later. This methodology replicated the original validation study in Spain . The FAST was developed by the Bipolar Disorder Program, Barcelona, Spain. It is an interviewer-administered instrument which is designed to be used by a trained clinician; the studied time frame refers to the last 15 days before assessment. It comprises 24 items, which are divided among 6 the specific areas of functioning. All of items are rated using a 4-point scale, 0 = no difficulty, 1 = mild difficulty, 2 = moderate difficulty and 3 = severe difficulty. The global score is obtained when the scores of each item are added up. The higher the score, the more serious the difficulties are, so FAST is actually measuring disability . The original version was translated in Italian to Spanish back translated and approved by a Spanish native speaker working as researchers in the field of bipolar disorder. A more detailed description of the instrument is shown in the original paper of Rosa et al . Besides the Italian version is included in the current paper as an Appendix. The use of this tool is free under the terms of the Creative Commons Attribution non-commercial License (http://creative-com-mons.org/licenses/by-nc/3.0/) which permits unrestricted, non-commercial use, distribution and reproduction in any medium, providing that the work is properly cited. We analyzed the feasibility, internal consistency, concurrent validity, validity as a discriminative measure to detect difference between cases and controls and euthymic and acute patients, and test-retest reliability of the FAST. Except for test-retest reliability measured by means of the K value, the psychometric characteristics of the FAST are derived from the first administration of the questionnaire, including all the subjects who completed it in the analysis. Statistical analysis was performed using SPSS for Windows – Version 11.0 (SPSS Inc., Chicago, IL, USA). Pearson's correlation coefficient was performed to examine the correlation between FAST and GAF scores (for t0 and t1 performances) and between t0 and t1 scores for GAF, FAST total score and specific areas scores, HDRS and YMRS. The GAF was chosen as the scale to assess concurrent validity of the FAST because it the main instrument for assessing functional outcome in mental disorders. Internal consistency was analyzed using the Cronbach's alpha. The inter-rater reliability of the FAS was measured comparing to and t1 total using both the correlation coefficient of Pearson and the K Cohen’s value. Total scores of FAST of three groups (non patient, euthymic, manic and depressed) were compared using a one-way ANOVA. Twenty-two bipolar patients (13 BP I, 19 BP II) and 20 healthy controls were included in the study. The bipolar sample included 14 women (63.6%) whilst this rate was similar (12 women, 60%) in the control group. Ten (45.4%) of the patients were considered to be euthymic , 6 (27.3%) were depressed and another 6 (27.3%) presented a manic or mixed episode at study entry. Two manic patients both women and manic at the first evaluation (aged 35 and 52) were excluded because they didn’t remain stable for a week. The mean age in the patients group was 43.95 years (SD: 12.61, median 47, ranging from 19 to 65) whilst the mean age of the controls was 43.35 years (SD:12.32, median 47, ranging from 19 to 68). There were no significant differences between the two groups regarding demographic baseline variables. Table 1 describes the main socio-demographic and clinical characteristics of the sample and the scores at HDRS, Young Mania Rating Scale and GAF at the two evaluation times, showing the stability between times of the score in both cases and controls of the three tools. Data indicated also a higher difference between case and controls in the HDRS, Young Mania Rating Scale and GAF at the two assessments. The stability between times was found by calculating the correlation between scores at t0 and t1 for the three tools. The P correlation coefficient was r=0.93 (82 df, p<0.001) for HDRS; r=0.78 for Young Mania rating scale(82 df, p<0.001); and r=0.95 for GAF scores (82 df, p<0.001). All items of the FAST were answered by 98% by the patients and controls (n = 42) in every test session. The mean time spent in completing the instrument was 6.15 +/- 1.12 minutes. The internal consistency coefficient obtained was high, Cronbach's alpha of 0.9557 (Table 2), for the total scale, indicating that the items are sufficiently homogeneous. With split half methodology the consistency remains high performing a Cronbach’s alpha of 0.9132. The test re-test reliability of the FAS was measured comparing t0 and t1 scores using both the correlation coefficient of Pearson and the K value. 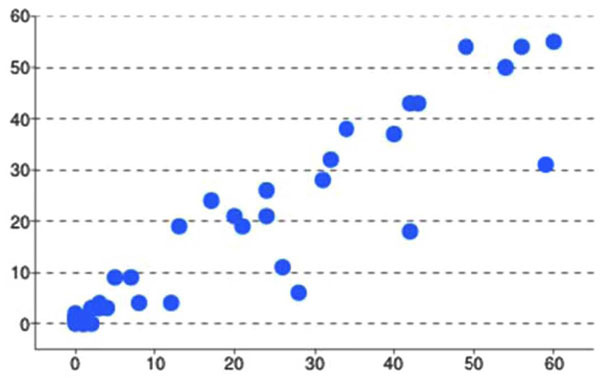 The correlation between the total scores for each subject at t0 and t1 shows a Pearson correlation coefficient of r=0.97 (82 df; p<0.0001) (Fig. 1). A similar correlation was found also taking in to account the scores at the specific areas of the FANS: Fast Autonomy r=0.87; Fast Work r=0.87; Fast Cognition r=0.80; Fast Financial r=0.87; Fast Social Relationship r=0.92; Fast Free Time r=0.86, for all these measures the correlations were statistically significant (df 82, p<0.0001). Correlation Between scores of each item at FAST comparing T0 and T1. 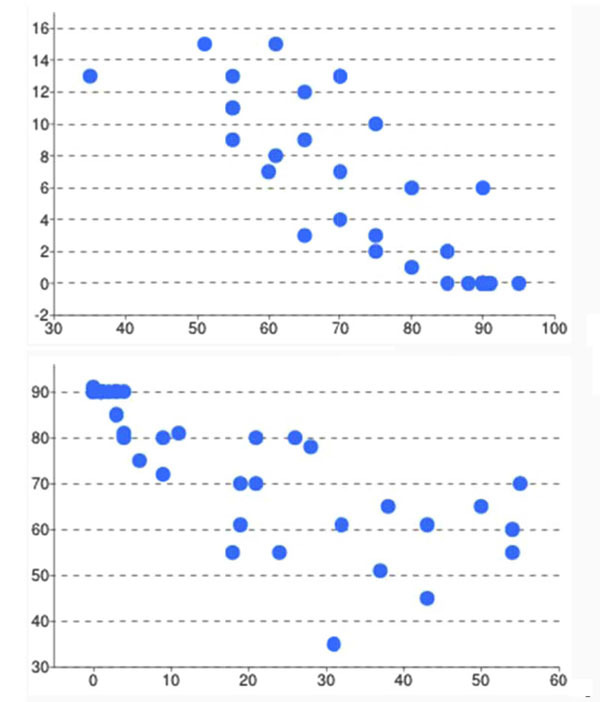 A Pearson correlation between scores of GAF and scores of FAST. * Negative correlation between total scores of FAST and GAF to (r = -0.862; p < 0.001), t1 (r=-0.792; p<0.001). Table 3 show the test re-test reliability measured by means of the K of Cohen statistics of each item of the FAST; the mean K of each specific area and as the mean K of the overall scale. The mean of the K of each items performed an agreement of K=0.75 (ES 0.03) in the two measures. The poor agreement was show for item 14 (K=0.49, ES 0.14); the better agreement for item 5 (K=0.94, ES 0.15). Concurrent validity based on functional impairment according to GAF scale showed a highly significant negative correlation (r = -0.862; p < 0.001 at the first evaluation and r=-0.791 at the second evaluation) (Fig. 2). This result indicates that patients with good functioning assessed using the FAST obtained higher scores on the GAF scale. Accordingly GAF scores indicated adjustment whereas FAST scores showed disability. The total GAF scores were found also to have negative correlation to each specific FAST areas: Autonomy (r=-0.76, p<0.0001; 2) Occupational functioning (r=-0.70 p<0.001); 3) Cognitive functioning (r=-0.63, p<0.0001); 4) Capacity of managing the finances (r=-0.37, p<0.37, p<0.001); 5) Interpersonal relationships (r=-0.86, p<0.0001); 6) Leisure Time (r=-0.68, p<0.0001). Validity was assessed using a discriminant measure to detect differences between bipolar patients and controls and euthymic and acute patients. The mean scores of FAST were higher in bipolar acutely ill patients compared to euthymic (32.13 ± 16.20 vs 1.73±1.88; F = 50.03; 1,42,43 df; p < 0.001). The mean scores of FAST were lower in euthymic patients (26.20 ± 9.41, F = 4.96; 1,20,21 df; p < 0.038), as compared with manic (38.83 ± 13.72, ) and depressed patients (36.33±13.59). Using a cut off of 11, as indicated by the previous validation study, the discrimination between euthymic and depressed and manic patient have a sensitivity of 100% but a specificity of only 30%; with an higher cut off (21) the accuracy improved with sensitivity of 83% and specificity of 60%. The results of the present study show that the Italian version of the FAST has similar psychometrics properties regarding internal consistency and discriminant validity of the original version and show a good test-retest reliability measured by K statistics. After their first validation study , the FAST has become a well-known international tool and it has been translated and validated into several languages . The introduction of this instrument partly fills the existing gap on the need of proper assessment of the functional burden associated to bipolar disorders. It also helps measuring the relationship between the functioning in specific areas and the relationship of social functioning with clinical variables as, for example, early vs late stage of disease , impulsivity , diagnosis subtypes  and so forth. At the same time the FAST allows to inquire in deep aspects of bipolar disorders impacting with the social burden of the disease as social function and stigma  and function related to specific care . The FAST represents a step forward compared to the previously existing instruments, which were usually quite complex, had longer times of administration and did not discriminate amongst areas of functioning [1, 12, 26]. Therefore, the FAST could become particularly useful. Similarly to the original version the Italian version of the FAST showed good psychometric properties such as high internal consistency, where the total items had a Cronbach's alpha above 0.9 and they remain higher than 0.9 also after the split half methodology. In addition, a strong concurrent validity, and a good discriminant validity were confirmed in the Italian version. The current study confirms also that the severity of symptoms was associated with higher scores of FAST and poorer functioning. In our sample a higher cut-off than that used in the Spanish version was more accurate for discriminate between euthymic and depressed or manic patients. However, this is probably not the most interesting propriety of the scale because it is not a screening tool useful to discriminate the clinical status of the patients. In the other hand, the clinical status is one of the factors determining social functioning but also other dimensions need to be take in consideration. These additional dimensions have probably links with the specific cultural background (see stigma , opportunities and so on ) and with the general well-being of a person (depending of a broader concept of health, ). Thus is not surprising that the level of social functioning associated with clinical impairment may vary amongst different cultures. With regards to concurrent validity, the FAST confirmed, as in the first validation study, a strong negative correlation with the GAF scale, which is the main instrument for assessing the current level of functioning [19, 41]. The GAF gives ratings from 0 to 100, which specifies anchors for quantification of overall psychosocial functioning adjustment, where the higher scores of GAF represent better psychosocial functioning [19, 42, 43]. In opposition to the GAF, the FAST assesses specific domains of functioning and also identifies the level of impairment in each area; higher scores represent higher disability thus a negative correlation was actually expected. The data of the present study indicate that each one of these domains had shown to be negative correlated to the overall GAF score, this is an indirect measure of the broad validity of the GAF but also an indication of the need of a more detailed measure of the specific functioning in each area. The test-retest reliability add probably some new data to the first validation study. The study indicate that not only the FAST reach a good correlation in the two measures (t0 and t1) but also the sub measures of each FAST areas show a strict correlation in the scores at the test re-test. More in details the test re-test reliability shown for each item a K agreement from sufficient to excellent. Sufficient (K from 0.40 to 0.60) was shown for items 14 (K=0.49); 10 (0.55); 2 (0.57); 13 and 15 (0.60); Good (K from 0.60 to 0.80) for items 3; 24 (K=0.61); (K=0.62); 4 (0.64); 12 and 21 (0.69); 23 (0.68); 11 (0.72); 8 and 19 (0.73); 9 and 18 (0.77); Excellent (K from 0.80 to 1) for items 17 (K=0.82); 6 (0.83); 22 (0.84); 1 (0.88); 7 and 20 (0.89); 16 (0.92) and 5 (0.94). The use of functioning outcomes is increasingly being advocated in multinational clinical trials and comparative studies. Hence, there is a need for pragmatic, valid, reliable and user-friendly tools available in as many languages as possible . The Italian validation of the Functioning Assessment Short Test (FAST), which was explicitly designed to gauge functioning dimensions empirically linked to bipolar disorder, has shown sufficient validity and reliability, which enables its use in Italian studies and in international clinical trials and comparative studies. Dr. Francesc Colom has served as advisory or speaker for the following companies: Adamed, Astra Zeneca, Bristol-Myers, Eli-Lilly, Glaxo-Smith-Kline, Lundbeck, MSD-Merck, Otsuka, Pfizer Inc, Sanofi-Aventis, Shire and Tecnifar. He has received copyright fees from: Cambridge University Press, Solal Ed., Ars Médica, Giovani Fioriti Ed., Medipage, La Esfera de Los Libros, Morales i Torres Ed, Panamericana, Mayo Ed. & Columna. Prof Mauro Giovanni Carta served as advisory speaker for the following public institutions: EMA, Social and Economic European Committee; Regione Autonoma della Sardegna. He has received copyright fees from OS Edizioni Speciali, Firenze. Francesc Colom received support and funding of the Spanish Ministry of Health, Instituto de Salud Carlos III, CIBER-SAM. Dr Colom is also funded by the Spanish Ministry of Economy and Competitivity, Instituto Carlos III, through a ‘‘Miguel Servet’’ postdoctoral contract (CP08/00140) and a FIS (PS09/01044). Prof Mauro Giovanni Carta received support and funding of the Regione Autonoma della Sardegna, Agenzia Italiana del Farmaco, Executive Agency of Health and Conusmers of European Union (EAHC), European Social Found, Astra Zeneca. Fino a che punto il paziente sta vivendo difficoltà nei seguenti aspetti? Interrogare il paziente sulle difficoltà nelle varie aree di funzionamento e assegnare un valore secondo la seguente scala: (0): nessuna difficoltà, (1): difficoltà lieve, (2): difficoltà moderata, (3): difficoltà grave. Rosa AR, Sánchez-Moreno J, Martínez-Aran A, et al. Validity and reliability of the Functioning Assessment Short Test (FAST) in bipolar disorder Clin Pract Epidemiol Ment Health 2007; 3: 5. Passarotti AM, Sweeney JA, Pavuluri MN. Differential engagement of cognitive and affective neural systems in pediatric bipolar disorder and attention deficit hyperactivity disorder J Int Neuropsychol Soc 2010; 6(1 ): 06-17. Rock PL, Goodwin GM, Harmer CJ. The common adolescent bipolar phenotype shows positive biases in emotional processing Bipolar Disord 2010; 12(6 ): 606-15. Cannon M, Jones P, Gilvarry C, et al. Premorbid social functioning in schizophrenia and bipolar disorder: similarities and differences Am J Psychiatry 1997; 154(11 ): 544-0. Reichenberg A, Weiser M, Rabinowitz J, et al. A population-based cohort study of premorbid intellectual, language, and behavioral functioning in patients with schizophrenia, schizoaffective disorder, and nonpsychotic bipolar disorder Am J Psychiatry 2002; 159(12 ): 2027-35. Rietschel M, Georgi A, Schmael C, et al. Premorbid adjustment: a phenotype highlighting a distinction rather than an overlap between schizophrenia and bipolar disorder Schizophr Res 2009; 110(1-3 ): 33-9. Uzelac S, Jaeger J, Berns S, Gonzales C. Premorbid adjustment in bipolar disorder: comparison with schizophrenia J Nerv Ment Dis 2006; 94(9 ): 654-8. Judd LL, Schettler PJ, Solomon DA, et al. Psychosocial disability and work role function compared across the long-term course of bipolar I, bipolar II and unipolar major depressive disorders J Affect Disord 2008; 108(1-2 ): 9-58. Kraepelin E. Manic-depressive insanity and paranoia, Translated by Barclay RM, Edinburgh SLR. Edinburgh SLR. New York: Arno Press 1921. Goldberg JF, Harrow M, Grossman LS. Course and outcome in bipolar affective disorder: a longitudinal follow-up study Am J Psychiatry 1995; 152: 379-84. MacQueen GM, Young LT, Robb JC, Marriott M, Cooke RG, Joffe RT. Effect of number of episodes on wellbeing and functioning of patients with bipolar disorder Acta Psychiatr Scand 2000; 101: 374-81. Zarate CA Jr, Tohen M, Land M, Cavanagh S. Functional impairment and cognition in bipolar disorder Psychiatr Q 2000; 71: 309-29. Fagiolini A, Kupfer DJ, Masalehdan A, Scott JA, Houck PR, Frank E. Functional impairment in the remission phase of bipolar disorder Bipolar Disord 2005; 7: 281-5. Tohen M, Hennen J, Zarate CM Jr, et al. Two-year syndromal and functional recovery in 219 cases of first-episode major affective disorder with psychotic features Am J Psychiatry 2000; 157: 220-8. Blumer D. The illness of Vincent van Gogh Am J Psychiatry 2002; 159(4 ): 519-6. MacCabe JH, Lambe MP, Cnattingius S, et al. Excellent school performance at age 16 and risk of adult bipolar disorder: national cohort study Br J Psychiatry 2010; 196(2 ): 109-5. Das Gupta R, Guest JF. Annual cost of bipolar disorder to UK society Br J Psychiatry 2002; 180: 227-33. Goldberg JF, Harrow M. Bipolar disorders: clinical course and outcome. Washington D.C., USA: Am Psychiatry Press 1999. Martinez-Aran A, Vieta E, Torrent C, et al. Functional outcome in bipolar disorder: the role of clinical and cognitive factors Bipolar Disord 2007; 9(1-2 ): 103-3. Sanchez-Moreno J, Martinez-Aran A, Tabarés-Seisdedos R, Torrent C, Vieta E, Ayuso-Mateos JL. Functioning and disability in bipolar disorder: an extensive review Psychother Psychosom 2009; 78(5 ): 285-97. Treuer T, Tohen M. Predicting the course and outcome of bipolar disorder: a review Eur Psychiatr 2010; 25(6 ): 328-3. Bhattacharyya R, Ghoshal MK, Sanyal D, Guha P, Chakraborty S. Issues in estimating the course of rapid- cycling bipolar disorder Am J Psychiatry 2009; 166(3 ): 370. Vieta E. Long-term treatment of bipolar depression and other issues J Clin Psychiatry 2010; 71(3 ): e07. Burdick KE, Goldberg JF, Harrow M. Neurocognitive dysfunction and psychosocial outcome in patients with bipolar I disorder at 15 year follow-up Acta Psychiatr Scand 2010; 122(6 ): 499-506. Strakowski SM, Williams JR, Fleck DE, Delbello MP. Eight-month functional outcome from mania following a first psychiatric hospitalization J Psychiatr Res 2000; 34: 93-200. Keck PE Jr, McElroy SL, Strakowski SM, et al. 12-month outcome of patients with bipolar disorder following hospitalization for a manic or mixed episode Am J Psychiatry 1998; 155: 646-52. Altshuler L, Mintz J, Leight K. The Life Functioning Questionnaire (LFQ): a brief, gender-neutral scale assessing functional outcome J Psychiatr Res 2002; 112: 161-82. First MB, Spitzer R, Gibbon M. Structured clinical interview for DSM-IV Axis I Disorders In: Biometrics Research Deparment ed. Washington DC: Am Psychiat Press Inc 1997. Palma A, Pancheri P. Scale di Valutazione e di misura dei sintomi psichiatrici In: Cassano GB, Pancheri P, Eds. Trattato Italiano di Psichiatria. Seconda ed. Italia, Milano: Masson 2003. Andreoli V, Cassano GB, Rossi R. DSM-IV TR, Versione Italiana. Seconda ed. Milano: Masson 2003. Giglio LM, Magalhães PV, Kapczinski NS, Walz JC, Kapczinski F. Functional impact of biological rhythm disturbance in bipolar disorder J Psychiatr Res 2010; 44(4 ): 220-3. Rosa AR, González-Ortega I, González-Pinto A, et al. One-year psychosocial functioning in patients in the early vs. late stage of bipolar disorder Acta Psychiatr Scand 2012; 125(4 ): 335-41. Jiménez E, Arias B, Castellví P, et al. Impulsivity and functional impairment in bipolar disorder J Affect Disord 2012; 136(3 ): 491-7. Rosa AR, Bonnín CM, Vázquez GH, et al. Functional impairment in bipolar II disorder: is it as disabling as bipolar I? J Affect Disord 2010; 127(1-3 ): 71-6. Vázquez GH, Kapczinski F, Magalhaes PV, et al. Ibero-American Network on Bipolar Disorders group. Stigma and functioning in patients with bipolar disorder J Affect Disord 2011; 130(1-2 ): 323-7. Rosa AR, Reinares M, Amann B, et al. Six-month functional outcome of a bipolar disorder cohort in the context of a specialized-care program Bipolar Disord 2011; 13(7-8 ): 679-86. Angermeyer MC, Holzinger A, Carta MG, Schomerus G. Biogenetic explanations and public acceptance of mental illness: systematic review of population studies Br J Psychiatry 2011; 199: 367-72. Carta MG, Kovess V, Hardoy MC, et al. Psychosocial wellbeing and psychiatric care in the European Communities: analysis of macro indicators Soc Psychiatry Psychiatr Epidemiol 2004; 39(11 ): 883-92. Vieta E, Cieza A, Stucki G, et al. Developing core sets for persons with bipolar disorder based on the International Classification of Functioning, Disability and Health Bipolar Disord 2007; 9: 16-24. Carta MG, Hardoy MC, Pilu A, et al. Improving physical quality of life with group physical activity in the adjunctive treatment of major depressive disorder Clin Pract Epidemol Ment Health 2008; 4(1 ): 1. Pilu A, Sorba M, Hardoy MC, et al. Efficacy of physical activity in the adjunctive treatment of major depressive disorders: preliminary results Clin Pract Epidemol Ment Health 2007; 3: 8.